The Secret Gardens of Normandy La Seine-Maritime is the region of Upper Normandy in France that lies between Dieppe and Rouen. There is a ‘daisy chain’ of remarkable gardens which thread their way from Varengeville to Vernon, from the sea to the River Seine: all country gardens set amidst old cider orchards, lush rolling pastures, and mixed woodland, mostly owned by passionate gardeners with fine plant collections that excel from April to October and peak in June. Here is a selection of what are considered by many to be an inspiration, particularly to artists. 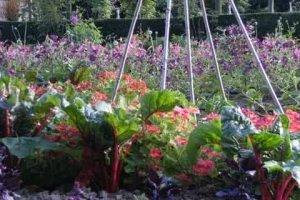 Perhaps the most famous of these gardens is that of Oscar-Claude Monet at Giverny . Monet, a founder of French Impressionist painting, and the most consistent and prolific practitioner of the movement’s philosophy . It was his ambition to document the French countryside which led him to adopt a method of painting the same scene many times in order to capture the changing of light and the passing of the seasons. From 1883 Monet lived at Giverny where he purchased a house and property, and began a vast landscaping project which included lily ponds that would become the subjects of his best-known works. In 1899 he began painting the water lilies, first in vertical views with a Japanese bridge as a central feature, and later in the series of large-scale paintings that occupied him continuously for the next 20 years. The overall mix of formal and informal, the somber green of the box and the jewel colours of the flowers is really superb. Favourite plants here are dahlias, crocosmias, heleniums, kniphofias and of course grasses – giving the plumes the garden is named for. The Autumn garden is magical with an array of grasses and cimifugias which make the backdrop to the asters and helianthus etc a bit like a firework display. Because of the strong structural element to the garden and the use of plants which remain interesting in the winter, the garden remains a beautiful sight in the wintertime. Les Jardins Agapanthe Is another example of the breadth of originality to be found among the new wave of French gardens. As intimate and secluded as Plume is open to the sky and landscape, it has been designed and planted with singular vision by 38-year-old architecte-paysagiste Alexandre Thomas. The tone of this stylish garden is set from the moment you pass through the gate in the boundary hedge and step into the garden pavilion, the walls of which are covered with red Toile de Jouy fabric. A labyrinth of narrow paths flanked by lush vegetation weaves its way around corners, over bridges, up and down steps, through a long pergola, opening out here and there into clearings of what can best be described as imaginative garden tableaux. You might suddenly find yourself stepping into a Mediterranean garden with beach pebbles and dwarf pines, or peering into a pond so swampy that a pair of glinting crocodile eyes wouldn’t be out of place, or stepping down into the sunken lavender theatre ornamented with stone portals and a fountain, set against a raised backdrop of clipped yews of various heights and shapes. The garden is dotted with charming half-timbered buildings designed by Thomas in the Norman vernacular. His love of old things is everywhere: the entire garden is filled with chairs, tables, ironwork, urns and vases sourced from brocantes and antique shops, as well as modern zinc planters. The Potager Arc En Ciel De Bosmelet If you want to see a French-style potager updated to make a very modern garden then this is the garden to visit. (Potager is the French word for vegetable garden). 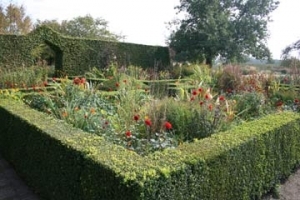 The kitchen garden covers two acres and a part of this is given over to Baroness Laurence de Bosmelet’s rainbow (arc en ciel) kitchen garden which won a gold medal in the 2007 Chelsea Flower Show. The vegetables along with fruit and flowers are laid out in a rainbow colour scheme and rarely have vegetables looked so beautiful. More than 900 varieties of vegetables, fruit and flowers are laid out in the design. The colours are split into 4 main groups: amber, saphire, ivory and garnet. These blocks of colour are then repeated in a formal pattern and the overall effect is stunning. The ideas from this garden were used in the Chelsea Flower Show. 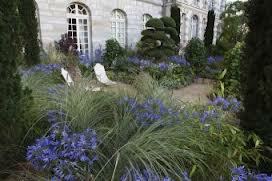 This is the first French garden to have competed at Chelsea but perhaps others will now be inspired by their success. Experience Painting in the Secret Gardens Rich in symbolism and metaphor, and blessed with its own varied and dramatic palette, the garden has proved to be an extremely fertile source of artistic inspiration. Join Pamela Kay and experience the joy and inspiration of the secret gardens of Haute Normandy. A brief history of Normandy Normandy is one of the great historic regions of France; in the Middle Ages, Normandy was a great dukedom where the dukes of Normandy managed to achieve the same status as the kings of France. Before he died, the king of England, Edward the Confessor, named his nephew William, duke of Normandy, as his successor. But after Harold, William’s cousin, took the English crown for himself, William invaded England in 1066, to assert his claim to a royal crown. The story of Harold and William the Conqueror is magnificently told in the historic Bayeux Tapestry, which can be visited in Bayeux, a few miles to the west of Caen. Upper Normandy (Haute-Normandie in French) was created in 1984 from the split of Normandy into two administrative regions, a political decision that is still contested to this day. With an area of merely 12,317 km2, it is the smallest region on continental France after Alsace and Île-de-France. Towns and cities in Normandy Le Havre, Caen and Rouen are the three main cities in this region. There are four smaller cities – or large towns, these being Evreux, in the Eure, Cherbourg – still an active seaport, though less than in its heyday when it was France’s gateway to America – Dieppe, a minor seaport, and Alençon, capital of the Orne. Outside the towns and cities, Normandy is a prosperous agricultural area, specialising in dairy products, fruit (notably apples) and mixed farming. The most famous regional products are the cheese Camembert, and two drinks, Cider and the spirit distilled from it, Calvados. Normandy is also famous for its racehorses, and the region has many top breeding stables. With their historic links and their proximity, it is hardly surprising that the Normandy area has much in common with the south of England; the rolling countryside is not too different – fields and meadows bordered by hedges, even bluebell woods. Furthermore, the historic and vernacular styles of architecture are not too different either. Normandy is so accessible by road, rail and air, that it is a perfect destination for garden lovers and creative souls.